Many great, rare, vintage and colourful beers decorated the taps of Beer DeLuxe during Good Beer Week when the Fed Square venue was Festival Hub. Among the most colourful was one that the staff at the venue had conceived and brewed with the guys at Moon Dog before the festival. In a change from the brewery's current penchant for recreating other beverages in beer form, this one saw the joint venturers look to create one of their favourite ice creams: Splice. And, while the festival is passed for another year, the Splice lives on at the brewery and bar a while longer. It's ostensibly an IPA, albeit an IPA that's been fruitified with pineapple (and possibly lime) to assist the hops in creating a suitably Splice-like tropical character, and then ice creamified too. This was achieved via the addition of lactose, the milk sugar usually only seen in sweet stouts to give them a creamy sweetness. 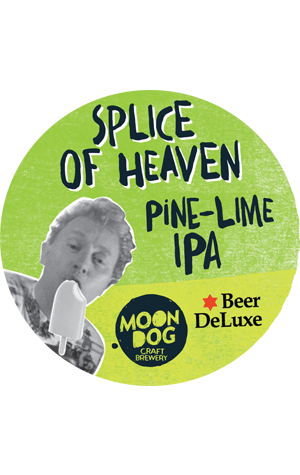 The lactose does that here too, creating a combination with the fruit and beer that might – like many things that come out of Moon Dog – sound like it should be hideous. But – like many things that come out of Moon Dog – it works, being not only remarkably Splice-like but rather drinkable too.